The Occupy Movement has revived May Day. For far too many years, this holiday, which was of course also a solidarity-building occasion, has been ignored by the US labor movement. Ironic, given the fact that May Day actually began in the US. Here’s a bit of the history behind May Day. 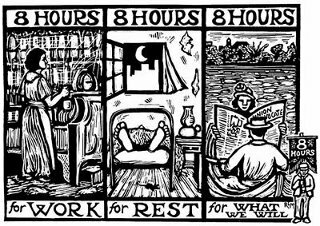 In 1884, militant unions in the US declared that eight hours would constitute a legal day’s work beginning on May 1, 1886. When workers went on strike at a factory in Chicago on May 3, 1886, police fired into the peacefully assembled crowd, killing four and wounding many others. The workers movement called for a mass rally the next day in Haymarket Square to protest this brutality. The rally proceeded peacefully until the end when 180 police officers entered the square and ordered the crowd to disperse. At that point, someone threw a bomb, killing one police officer and wounding 70 others. The police responded by firing into the crowd, killing one and injuring many others. Following the Haymarket Affair, eight of the city’s most active unionists were charged with conspiracy to commit murder even though only one was actually present at the meeting. All eight were found guilty and sentenced to death. Commemoration of this day and the outrages against justice that followed quickly became an key element of the international struggle for worker’s rights. Why was May Day not celebrated in the US? In a demonstration of the complicit nature of segments of the US labor movement, the Knights of Labor (a racially exclusionary organization) caved in to the demand of President Grover Cleveland that the Haymarket Massacre would not be commemorated on May Day. So we now have a state-sanctioned and relatively toothless Labor Day in early September. Yesterday Occupy revived the suppressed tradition of May Day on a joyous celebration of solidarity and outrage. The day started out for me with brilliant talks offered in Madison Square Park by folks like David Harvey, Frances Fox Piven, Andrew Ross, Drucilla Cornell. The Free University provided a great space to listen to debates about a series of key issues, from the right to the city, to student loans and debt, to the history of the labor movement. Unfortunately, all was not wine and roses. The police refused to allow us to march out of Union Square. As this image makes clear, they set up steel cattle pens in order to box marchers in, and then arbitrarily blocked off exist from these pens when it was time to march. Most of the demonstrators around me, seasoned protesters all, told me that this was in order to demonstrate the police’s power over us rather than to preserve our safety during the march. 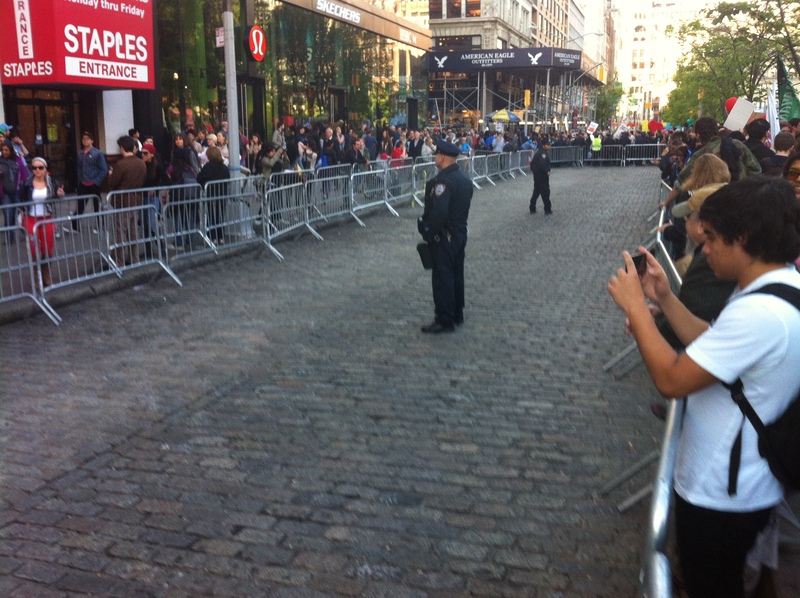 In fact, once they eventually let us out of the cattle pens, instead of allowing us to march directly down Broadway, where the march had been permitted, the police instead directed us down W. 17th street to 6th Avenue, so that we had to walk through the middle of traffic. This was obviously not a safe situation. Police officers then lined the street and tried to force us onto the sidewalk, despite the fact that our march was permitted. Tempers quickly frayed, and it looked like things were not going to go well. A friend of mine was violently pushed into a pile of garbage on a sidewalk by a group of police when he challenged their attempt to force us onto the sidewalk. Thankfully, we eventually got back to Broadway and the rest of the march proceeded in a jubilant spirit. Not surprisingly, mainstream media coverage latched onto the scuffles and arrests that resulted from the police kettling strategies rather than focusing on the joyous and constructive spirit of the rest of the day. This article in the New York Times is typical of such a jaundiced approach. Luckily, though, there are other sources of information and reflection about the events of yesterday, including this excellent coverage on Democracy Now, which highlights the international dimensions of the protests. It was an undeniably great day for radical activism and for the movement for global justice. That said, this May Day was more of a celebration of our collective and potential powers than a real General Strike (which is what many Occupy activists had called for). Much work remains to be done before the dispersed powers of the movement can be collected into a force capable of doing real damage to capital, let alone giving birth to a new world. New York State Governor David Patterson is trying to impose furloughs on 100,000 state workers. I’m one of them. The fiscal crisis of the state is getting very personal! U.S. District Judge Lawrence Kahn has just ruled that Patterson and the Albany lawmakers who went along with his plan to punish what Pierre Bourdieu calls “the left hand of the state” – municipal employees like teachers who maintain the social democratic wing of the state – cannot carry their plan forward until he rules on union lawsuits that challenge this move. According to Kahn, unions have successfully demonstrated that a permanent 20 percent loss in wages or salaries would constitute irreparable harm. This is an incredibly important decision since it prevents New York from establishing a precedent similar to the horrendous one in California. But the news isn’t all bread and roses. Thousands of employees of the Metropolitan Transit Authority are still going to lose their jobs, for example. This isn’t just pain for MTA employees, It will also mean that more of the booths at subway stations become vacant, making the subway system more dangerous and dysfunctional. But then the rich in NYC probably don’t use the subway anyway. In other local news, according to an article in the New York Times, someone paid nearly $29 million dollars for a painting of the U.S. flag by Jasper Johns. Wonder why this individual didn’t manifest her or his patriotism by using that money to support the working people who keep this country going? Wonder why the governor won’t raise taxes on people who have $29 million dollars at their disposal for a painting. My union, the Professional Staff Congress, was one of four public-employee unions that brought the suit to stop Patterson and the legislature from putting us on furlough. What a great victory for solidarity and collective resistance! H ere’s a copy of the judge’s restraining order. And here’s to stopping the ravenous zombies who are destroying the country and the planet from eating all our brains!